Microsoft has announced the launch of the free anti-malware Security Essentials. 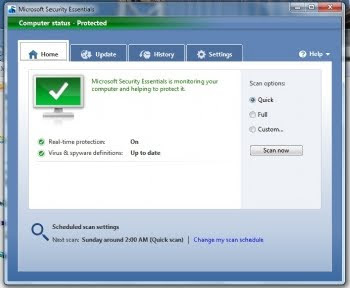 It uses the Dynamic Signature Service, a Microsoft technology that ensures users are protected by the most current virus definitions available without having to wait for the next scheduled download. In addition, it is designed to run quietly in the background and limits CPU and memory usage. Unfortunatly, it is a still in beta and available to customers in the United States, Israel, China and Brazil only. Although I think that the age of the "Signature Based" security is over and the furure lays with concepts such as profiling (AppArmor), labeling (SELinux and Solaris Trusted Extensions) and Mandatory Access Control, that is a still welcomed edition to the information security domain. Posted by John Markh at 9:22 a.m.